– I’m nervous– said him, and then I realized I had no words for describing that sensation. 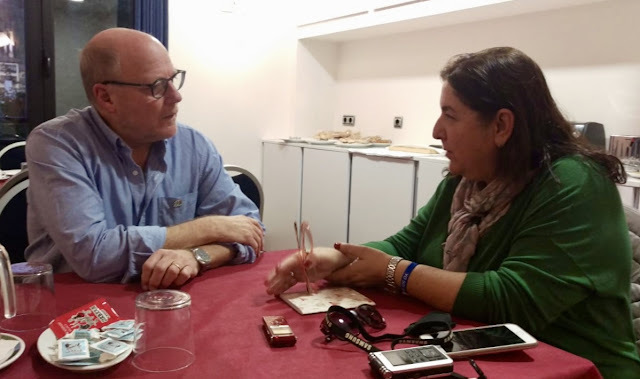 Because since I asked him to do this interview, one week before, doubts, responsibility, nerves and all kind of emotions came to my life, but my essential emotion was a very big illusion. To know that you will interview the choirmaster of the Philippine Madrigal Singers is a very special feeling. Its true that we already knew each other, that we had been in contact several years ago by different reasons, that but does not change things. 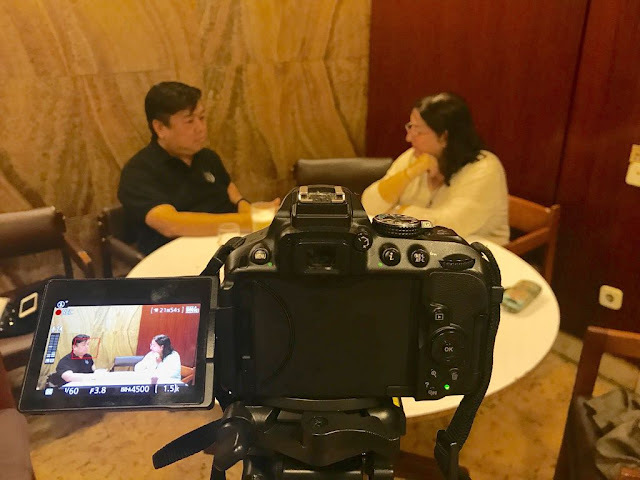 This interview with Mark Anthony Carpio is a premiere. Cantate Mundi starts a new section within its website: The Lectern. From it and for all our followers and everyone who wants, we will share a different way of learning, a kind of e-learning through the words of great composers, conductors, choirmasters, musicians and all kind of people that we consider of interest. We will not stop in the music they do but in the way they think or they are, in the words they use to describe his works, to make their dreams coms true, to live. To know them better is to learn from them. We start with Mark Anthony Carpio and will go wherever this learning road takes us. Two big glasses of coffee, water, the audio recorder and my papers with the questions over the table, the camera standing in front of us and all ready. After a brief introduction about the idea that had taken me to that point, our interview started. Mark Anthony Carpio is always smiling, with a non-stop smile, he is as much expressive speaking as conducting his choir from his apparent statism. – How do you arrive to music? – When my two sisters and I were young, our father made us study the piano. A teacher would come to our house once a week and we would learn how to play the piano. In my younger years I was also a member of the children’s choir. I loved that, it was memorable for me. In High School I stopped singing but I continued playing piano and had the chance to study under a teacher from the University of Philippines College of Music for one year. It was a scholarship. When it was my time to go to College, to the University, my father told me to take music. I wanted to be like him, he was an engineer. I wanted to follow him because I loved Math, I really loved Math, but then he encouraged me a lot to take music instead. – It is not very usual. – No. But I was a bit afraid of my father, because he was really disciplinary when we were growing up. We made an agreement that ok, I’d take music but afterwards, after I finished music I would take any course I liked, and he agreed. But when I was already in the College of Music in the University of Philippines, I learned to love it, I learned to love what I was doing. I never imagined I would play the piano for 6-8 hours a day, practicing. I never thought I would do it but I loved it. It was only later on, after I finished my studies that I joined this choir, although in the years before I was already a fan of the Philippine Madrigal Singers. In fact I wanted to join the group but I couldn't because of my studies. I thought maybe it would be a nice idea to improve my singing under the choirmaster Andrea Veneración. I was ashamed, so I studied first with other teachers before I asked her later on, maybe a year after, if I could take classes with her. And she gave me lessons. – And it was then after taking classes with her and when I finished my studies that I joined the Philippine Madrigal Singers. Mark is a person who has lived in three different ways his relationship with the group: as a fan, as a singer and now as a choirmaster, three interesting and perhaps complementary points of view. – Do you miss singing? – Yes! Very much. What I also miss is listening. When I was in the audience I was just appreciating what I would receive from this choir. Now that I’m the choirmaster, I love my job, of course, I love making music but then sometimes I find myself always looking for ways to make the music better, rather than enjoying what I get from the singers. That is something I miss, but of course I love when the singers are able to perform in the way I imagine the music to be. I guess every experience I had as a fan, as a member of the audience and also the experience I had when I was a singer, everything was a preparation to being the choirmaster. – Andrea Veneración. What does she mean for the Philippine Madrigal Singers and specially for you? – We call her the ‘Grandmother’ of choirs, of choral music in the Philippines, she is our National Artist. For all choristers she is our hero because of the things she had done and that she had achieved for the Philippines, for our country. For me she will always be the one pushing me. When I became the choirmaster she was there. She appointed me as choirmaster. I felt so lucky that she was there because I knew of some successors of choir conductors who only started leading when the previous conductor passed away. So I felt lucky and confident because I knew that if I did something wrong she would tell me. She gave me free hand. I really felt like a child with my mother just letting me walk, letting me run. If I sleep or if I fall down that is ok and that is exactly what happened, I made mistakes and learned a lot. I’m still learning but I still feel her presence whenever we rehearse, whenever we work, whenever we perform, I still hear her talking to me. – You are concerned with Philippine composers and their music, which you take around the world with you. That’s a kind of music ambassador for the Philippines, but you are also Honorary and Good Will Ambassadors within the UNESCO. You share list with names such as Plácido Domingo, Montserrat Caballé, Juan Diego Flórez, Jordi Savall… What does this designation mean? When one reads the reasons of this designation its said that is ‘for promoting dialogue and understanding among people in South East Asia’. How do you feel on this respect? – Even before I joined The Madz this group has been designated as goodwill ambassadors. When I joined it I thought it was an honor to be part of this group, Ambassadors of Good Will. By doing something we love to do, by singing we are able to connect to other people and do something to improve their wellbeing. It’s always good to talk to people after each concert and know how they enjoyed, how they felt good while listening to us or even after listening to us. The UNESCO designation is like a stamp of what we have been doing for many years. Now we believe it’s really an honor and it makes us believe more on the good thing we are doing, that we are able to promote peace to different people, to different cultures. It makes us really believe in ourselves: just by singing together we are able to show to other people how possible it is to achieve something good and to do something beautiful and to share that with them. I’m very sorry for the very noisy ambiance, but last minute notices made us change the place of our interview. However, the owner of Gran Cafetería Santander was very kind by letting us use one of the lounges of his café for the interview. – How is a normal rehearsal day for you? How many hours or days a week? How do you work with the choir? – We rehearse three times a week, two hours a day, but it is always flexible so sometimes we make it longer. Maybe instead of two hours, two and a half or three hours, and sometimes especially when we are preparing for a concert or for something big we have more rehearsals, everybody has to be there. – But you stay all the time together, women and men in the rehearsal? – Women and men? It depends on the difficulty of the piece. Generally we start rehearsing in sectional formation. Especially when I want the singers to have an idea of the score quickly, sometimes I ask them to do it in the mixed formation we do in the performance. But then as many conductors do, I still have to cut the piece into details and make them see those little details by making them sing only by themselves, the sopranos only, etc., even if they are in the mixed formation. – The way of standing in the stage is the same when you are in a concert or in the rehearsal room? – In the rehearsals I usually stand in the centre to get an idea of the balance of the singers and thats when I ask individual singers to sing a little more or sing a little less depending on what I hear but generally the formation is the same. Then in the few rehearsals before the performance, we do it in the way we perform. At this moment of our conversation I do believe he feels comfortable. I do too. He is a very expressive man, always making gestures and constantly moving his hands: he lightly touches his hair, crosses his hands, stands his hands over the table. And a very nice gesture from him is when he bites his tongue literally or bites his thumb while listening to my questions. His smile is always present and his laugh is true-hearted. – The original question now, the one nobody can avoid, I guess: why the semicircle? – It’s a question that I think I could be answering forever, so we are not surprised if somebody asks that. When the choir was founded in 1963 the first members wanted to follow or to sing in the way the singers would do during the Renaissance. During that time there were no stages, there were no risers for choirs to perform. The madrigals were being sung during banquets and gatherings and usually were accompanied by food, wine and drinking and composers handed music sheets to the singers and they sang. The first members wanted to follow that example in the first public performance having the chairs, no more table for the food and wine, so they thought that it would be a good idea to stay in the semicircle. At first Andrea was sitting with them in the middle, but later on she decided it would be good for her to have an idea of the sound by sitting in the edge and not sing at all. So that has been the tradition of the group up to now and it has become the signature, the identifying mark of the group. When you see the chairs you say, ah, the Philippine Madrigal Singers. – And the reason that you are so close each one to the other? – That is something that came naturally for the group. I supposed it could be better if they feel each other, hear each other more, when they are closer. Later on we realized that when you feel each other’s breath, that is like passing the energy to one another and you feel that you are really in contact with each other. After singing a few times with the Philippine Madrigal Singers they usually say that it is more relaxing, they become tired easily if they stood the whole concert. Of course it’s something that takes time to get used to. There is a part of the choir that has not direct contact with the audience, the ones sat in the sides of the semicircle formation. However the audience gets moved by them and their music, and the contact audience-choir is felt in everyone’s skin, sometimes goosebumps skin. Mark laughs, but then immediately he stops laughing as always he talks about Andrea Veneración. One can see respect, gratitude and reverence always he refers to her. – Professor Andrea was first and foremost a pianist and singer before she became the choirmaster of the Madrigal Singers. She believed in the importance of the artist always connecting directly to the audience when performing so she taught us the importance of always singing and directing our attention and our focus to the audience in our performances, and in fact we have a name for that: we call it the ‘zero position’. We sing to somebody in the audience and sing the whole song to him and maybe in the next song we choose another one. Its not easy to do, of course, when an artist is trying to think of the notes and all the things they have to consider in music, but she insisted that we do that. All the time we perform, the important thing is the message of the song – how do you say?– that we are able to impart the message, emotion of the composer when he was writing it, to the one listening to us. For us to be able to do that, during rehearsal everything has to be taken care, every singer knows exactly what to do with every phrase, every measure, every note. It is very important, and even more without score, that they have it in their heads, it’s not easy but it’s very much possible to do, and it’s doable. That is always our goal for our rehearsals to be able to achieve that level of no one thinking of the notes but making sure that the one listening to us gets the message, the emotion that the composer had. Of course in performances the choirmaster would do the minimal gestures, for example at the beginning just making sure that everybody starts together and everybody ends together, and of course there are more or less twenty singers so its very much possible for one singer to forget something so that’s what we make sure would not happen in performances. This is why we rehearse, to make sure that everybody remembers what to do, how to do everything in the same way. – When I first watched one video of you I though you were there in the edge and you were doing nothing (he laughs out loud), yes, nothing, but it was important to be there, but five years ago now when you came also to Madrid with Coro de Voces Graves, for your performance in Colegio de Médicos, during that performance I had the chance to see you from a very close place, and I was really surprised as you made lots of gestures, lots of things, but how do they see that if they are not looking that way? – We practice it, we have our focus on the audience, especially the ones in the centre, but they make sure that they see me using their peripheral vision and they know exactly when to be attentive, they know in what part of the piece they need to pay more attention to what I do, to the gestures that I give, but we always do that together. It’s not now pay attention to me, now pay attention to the audience, we always do them together. – This thing that we do, performing together without someone leading his hands to sing, is something that our founder wanted to have and wanted the group to do. But she knew that it would be difficult for a much bigger choir. In a small group like ours everyone has to remember exactly what do do, every phrase, every note but many times it happens that one forgets and then the choirmaster has to remind exactly what to do in the piece to the singers so that in the performance any one can forget, but she knew the bigger the group is the more difficult it is to do. There are for example festivals where we are joined by several other choirs, where it would be impossible to sing together so there is a need for someone to stand in the middle telling the choir what to do. There is a gesture of Mark that is very usual in him: when talking about the choir, with the index and thumb fingers of his left hand he makes a semicircle and he later softly touches the semicircle with his right finger, as if he were really caressing the choir, the one he draws with his hand. Its a gesture that I really love. – How do you choose the scores for a concert? How do you choose one score to be sang by you? What does a song requiere to be sung by the Madz? – We have concerts themes. In the Philippines we are the resident company of the Cultural Center of The Philippines, which is the main venue for the performing arts so we regularly have concerts there and for every concert we try to unify things. We think of songs, choose songs, something related, we have to make sure that all the songs goes with the theme. It’s a constant job of the conductor to look at scores and study them, see the beauty in every score, in every word and try to see if it is something that can fit the theme of the concert. This is something that I do: look at scores, listen to music, listen to other choir performances… I have a list of outstanding pieces that I would like to do in the future. I just list them down on my phone. So whenever it’s needed I go back to the list. I joined The Madz many years ago and ever since then, I’ve been collecting and making a list of titles. There is a piece that we are doing now and I saw it maybe in 1994 but now is the chance. – How is your personal relationship with music? – I do a lot of listening, a lot of reading but I believe I can do more because I know of many conductors who spend more time listening to music. When I study music I do it the way I would study my piano pieces before analyzing them, the form, the structure, the harmony, the melodic lines, all the elements, I think this is what all musicians should do. In the school we were taught how to analyze music as professional musicians. I find myself doing that in this time and I believe that is very important to know exactly what the composer was thinking, what he was feeling when he wrote it. I believe the most effective performances would be those where the audience or the listeners felt or saw exactly what the composer felt or imagined when he was writing it. If the audience would see or feel that, it would mean that the performance was effective. – So when you commission an score and you talk to the composer, you do not have to imagine what would be he thinking about. Do you ask this information to the composers? – Sometimes composers send me their works and then knowing the composer I am able to ask exactly why he did this or that. If I see there is a way to make something better or there is a way for a part of the piece to be better for the choir to sing I give my recommendations, my suggestions to the composer. – Do they always agree? – It’s very laudable your way of making Phillipine music be well known around the world. Is this one of your focuses when making music? Is this the reason that you promote Philippine music, even by having a great composer within your choralists, such as Illy Matthew Maniano. – Andrea, from the very first concert they gave, she already believed in the importance of promoting Filipino compositions and composers, so and ever since then we have been blessed with a singer who knows how to write music. We always think it’s a blessing and we have had composers from the 60’s and we are still performing their music, from the 70s and 80s, 90s when I came in…. Every decade there is always somebody who is the resident composer of the group, but up to now those composers from the 60s and the 70s, continue to write their music for us. I am very blessed to continue working with them. From the beginning in every festival or show, Andrea always made sure that there was a Filipino work in the repertoire and this is something that I continue doing. But of course we appreciate very much compositions and works of different composers from different countries around the world and this is something that we share with our audience, with our fellow Filipinos and with our audience around the world. – Who are your technique workshops made for? How important you consider training, formation in a choir? Other types of workshop more than vocal technique? – In the 1990s Andrea realized that there were more choirs in the country than ever before, lets say in the 60’s. She knew that many of our choirs, especially outside Metro Manila, in the capital, were not able to receive the training which are normally given in the capital so what she started doing was to organize outreach projects where she would go to the countryside, to different places and take along with her some of the Madrigal Singers. She gave workshops not only for the singers but also for conductors. That is something that she started doing and we continue to do up to now. This year we have been blessed by opening Philippine Madrigal Singers Studio, where we ask the singers to give lessons focused in singing, in vocal technique and also I and other conductor hold workshops on conducting or similar workshops for conductors. The Studio is our education arm. So we have the performance arm and the studio takes care of all this education and giving workshops. – Your abroad tours. How can 25 people (perhaps more than that, the ones we do not see) live together, away from home, so much time. – It is not easy but we are bonded together with the passion for singing and making music together and I believe this is something that holds us together. The number of singers is relatively fewer than other choirs. Its not easy but its doable, we always look at ourselves like a family. In fact with all our former singers, all who have moved on, those who are now in different countries, we all consider ourselves as one big family. – You really have to become a family, yes. A friend of mine was really concerned about how you can manage your baggages for so much long tours, specially taking care of women dresses… Can’t imagine! – That is a big problem, it’s always a challenge for us especially when we have to fly on budget airlines and make sure that the weight of our baggage is in accordance with requirements but we help each other in that sense. Men have to be the ones helping women with their baggages. – No! –he says, laughing–. Sometimes of course it’s inevitable that in any place we go we see things that we would want to take home, we buy gifts and our baggages get heavier and heavier but once in a while we send some things back home, especially when we travel for few months. – Which are your resources, how can you economically afford a tour like this? – We can say this choir is self-supportive in a way. Because of the achievements of the previous batches of The Philippine Madrigal Singers under Andrea we get a lot of invitations and because of that, we get financial support for ourselves. But of course we get financial assistance from the Government, especially as we are the resident company of the Cultural Center of The Philippines, as I told you before, which is a government institution. Every so often we get financial support from another institution called The National Commission for Cultural and the Arts and that’s how we are able to travel. And this is also the reason why when we travel we spend a few months. It’s also to make sure that we recover everything we spend and also to make the trip more worthwhile because it is a big expense. – Have you got a team for organizing all around your tours? – Yes, I am grateful they are there and I don’t have to think of that. There is a team and they keep me informed once in a while. – They are not singers, are they? – This kind of living experiences do influence in the music you sing, in the way you conduct? – I believe so, especially when we meet other choirs or when we hear other sounds from other places. Its always a learning experience so we get new sound ideas and sometimes the singers themselves get ideas and (something) they would share with other singers, and in fact it affects our singing. These ideas we incorporate in the sound of the singers. – How is it the relationship with your host choirs after a tour? Do you keep in touch later? – It’s not easy because they are a lot, but there is a team that makes sure that we keep in touch with them. Thanks to technology it’s easier, not like before, to be in touch with our friends from host choirs. – Its very surprising how easy is for your choir just to sit and sing. When singing in a choir, we are used to be worried when the conductor is not in the line of our eyes, even if you think that sometimes the conductors stand up over a podium or raiser. It was really astonishing for me when I saw that you were in the lower stair, not even in the same level that the rest of the choir. I was concerned because it seemed so narrow. – Yes, but it still works. I also believe that it should be one of the conductors higher goals to make the choir be able to perform without him. If the choir is able to do a piece or two without the conductor, that says something about the conductor. – Also that says something about his manner of working– He looks very proud now. – Do you realize if your audience is being moved by your music? – As a conductor, I have my back facing the audience. I could say it is something that I could only feel, not see immediately. But I feel it with the applause. – During your last concert, the audience clapped for a long time after one on the songs, but you kept sat without moving, without facing, only listening the applauses. No one in the choir moved. What do you feel then? – I always remind the singers to receive whatever is given to them and make sure that the audience also feels that we appreciate what they are giving, perhaps by a simple gesture, a smile, the only thing we can do is look at them and take in what the audience is giving. But I don't know if the audience knows, well, I’m sure they do, that in any performance there exists a two-way giving. So how much the audience gives to the performance affects the performers. The long applause is very much appreciated and that is why in the next song we feel more inspired, more able to sing better, it’s always a give and take, in every performance. This is exactly what we miss, what we love experiencing here in Europe especially: the way the audience shows their appreciation with the long applauses and saying ‘¡Bravo!’. – Its not the same in other places? – Sadly no, maybe it’s a part of the culture. In some places its not part of the culture to show your appreciation although you appreciate very much, for example for the Filipinos its not a part of our culture to clap your hands for a long time. – Well, but we know, of course, because they are our friends, our family…we know they love what they hear from us, and they will tell us later. It’s something that we love here in Spain and other parts of Europe. I think this is something that the Filipinos have to learn. – The very first competition I joined with the Philippine Madrigal Singers, as a singer, was in Tolosa, 1996. Of course I love that because it was my first competition. And again as a choirmaster, the first competition I joined was in Torrevieja. I guess Spain will always have a very special place in my heart, and not to mention that we have been under their government protection for more than 300 years. – What are your expectations for Tolosa European Grand Prix? I know this is for sure the more embarrassing of all my questions, but I have to do it. I guess he chooses each single word, as it has to be. He is extremely polite and aware of the situation. This interview will be published after the celebration of the European Grand Prix, but things wont change in the contents of it, so we keep on the same questions and answer, no matter what the result of the contest is. – I expect that all the choirs will be performing well, I’m sure these winners from last year have been preparing well and we just have to enjoy performing, enjoy the product of one year of preparation for this competition. – What would happen if the Madrigal Singer won this EGP? It would be your third time with this award. The only choir in the world with this record. And what if not? – Right now my only concern is to perform well. I’m not really concerned about what will happen afterwards. Now that you are asking, if that doesn't happen we would just continue on what we are doing, and I can say it would be the same thing if it doesn't happen: we will have to continue doing what we are doing, sharing what we have by teaching other choirs. – No change in your way of working? – I don’t think there would be any change. – And now our composers, Spanish composers, Javi Busto, Josu Elberdin, their works, the works that you put on your lists or the ones you commission for the Madrigal Singers. What is your relationship with them? – We have performed several pieces of these composers, especially Javi or Josu and all these pieces we have performed we have fallen in love with them. With Javi since the 90s when I was a singer. After Tolosa when we have to come back for the EGP, the first piece was his Pater Noster, that composition really gets into us. There are several other works from them. I also believe there are several other composers that we can look at in Spain, but I guess Javi and Josu continue to occupy a special place in our hearts. – It’s my favorite song, I don't know why, but the text although it is Spanish, we always say that it’s very “Filipino”. That romanticism, like wanting to sacrifice yourself for someone you love, is something that Filipinos love to feel, and the music for me expressed it very much, very effectively what the text wants to say, and not to mention that in Torrevieja we had to pay much attention to that piece preparing it very well for the competition. I didn’t meet Javi in Torrevieja but I told him later how much I loved this piece. – You know very well the way of working and making music from choirs and conductors all over the world. Are there different ways of making music, singing and conducting here in Europa or in Asia, for example, or is it the same, music is the same everywhere? – I’m sure everybody wants to perform very well, all the conductors, all the choirs. I’m sure no one wants to have a bad performance. I only believe that for every group, for every choir, there is a specific way of performing. Our way may not be effective for another group and maybe their way would not be very effective for us and I guess this is something that you appreciate in this world as we do not have to do things in the same way. The differences that we show or that we do is what makes this world of ours beautiful and we should learn to appreciate these differences and just focus on what things you can get from these differences and not live on criticizing each other. – Music has a great deal of subjectivity. When one says “good, better than or best” of course this is not an arithmetic rule, but its very often said that the Madz is if not the best, at least one of the best choirs in the world. What do you feel when you listen this sentence? Does this become a responsibility for you? – Yes, definitely. I have taken it as a big, personal responsibility. When I took the task of being the choirmaster I knew I had some big shoes to fill. At the time, I also knew that people’s eyes where on me, on us, what would happen to the group, what will I do. I knew how big a responsibility I have, but I feel it all the time, not only when I get those words, when someone says that its one of the best choirs. I guess I become more humble when I hear that, it’s a very big responsibility. I believe this is something I have to live with, to continue reminding myself everyday, all the time when we prepare for rehearsals or performances. You know we are now preparing for a competition, this competition did not come planned. When we went to Arezzo last year that was not something that we planned to do way before. We got the invitation to join to this festival just a few months before, and as we would be there in Italy by that time, we said why not, we can participate, but usually choirs plan these things much time before. – We were there and now we are here agin, I am not sure if its something that we will do soon, I mean joining competitions, but definitely I believe there is so much beautiful music to do from all around the world, from Filipino composers, Spanish composers, so I would love to do it even if we do not join competitions, of course maintaining that competitive level. This year we have another CD containing works by a former member of the choir, Nilo Alcala, Onomatopoeia, I’m very happy with what we have done. This is something that we have been doing for many years and that we want to continue doing. We are in the process of finishing another one by our current resident composer. After that I also have a list, this is something I will do, I think something I would love to leave to choral community before I retire many many years later. – One question that is very important for me to ask you: technical singing or emotional singing, which is the exact proportion or which other things should be taken care of when singing. – Wow! Something also coming from our founder: it should always be a combination. We are concerned on our technique because we want to perform well but we are concerned about emotion because we want to be able to connect, to impart that emotion to the audience so both are things that should go hand in hand. It also depends on the music. There is a music terribly technical and it’s difficult to see what kind of emotion, even there is, because the composer probably wanted to write something difficult, like an exercise. – But thats a kind of emotion too, exactly, perhaps the work well done, the surprise of technical work. – Maybe. They should come hand in hand all the time. – ‘The final competition is found in the rehearsal room’, Andrea Veneración. This sentence, taken from your website, is really one I love. – She also mentioned that the competition is not the goal, it’s not the end, it’s a means to an end, and the end is really what the singers can achieve or develop in themselves while preparing for the competition. After the competition is over the task of the conductor is to make sure that whatever discipline the choir has developed, has learned in the process, will stay with them, not only in the performance but more specially in the rehearsal. She explained later on how important it is for a choir to make sure that the rehearsal is always better than the last one. If we always have the mentality of rehearsing better than yesterday then the choir would be a winner from the choir that rehearsed yesterday. – During a talk given by you and that I found in internet, I heard you saying something really curious about the question of the Madz ‘secret’. You said: ‘we pray and we work hard’. – Because this is something that Andrea herself mentioned every time before going to stage: we pray but its very important that we don't rely on divine intervention. We have to work to show what we want, what we really want, what we are praying for. – Your next time in Spain? – We would love to come here very often. – A next workshop in Cantate Mundi? We’d love that. – We have lots of things to learn from you. More than two hundred singers have passed through our workshops and courses in these 4 years. They will read this interview as if you were our guest conductor during one of our workshops. Any advice, any thing for them, for us? – I guess there is one thing that I would love to share with them, with all of you. You should not lose that desire to learn. We should not reach that point where we can say, its enough. We should always try to look for ways to be better, whether you are a conductor or you are a singer, so there are always many ways to sing better, ways to help you to become a better conductor and we should always search for those ways. We are lucky that the world has become smaller because of technology and we get to attend different conferences, workshops. We are able to see different things for each other. Don't stop learning. – You should teach us. Though I know he is tired, because of the effort of more than one hour and a half answering questions, speaking in a language that is not your own language, and even in front of a camera that is recording each one of your gestures and your words, though I’m also tired, I feel something like sadness to finish this incredible conversation. I’ve learned so much, not only about music but specially about life. I know I’ve had a number one just sat by my side, and I know how great he is as I’ve realized how humble and concerned about his job and the way to share it he is. Somewhere during this interview he said it seemed as he is still listening Andrea Veneración voice during rehearsals and performances. Its her voice, by means of Mark’s, the one I’ve also heard during this interview, which is a real privilege for me. 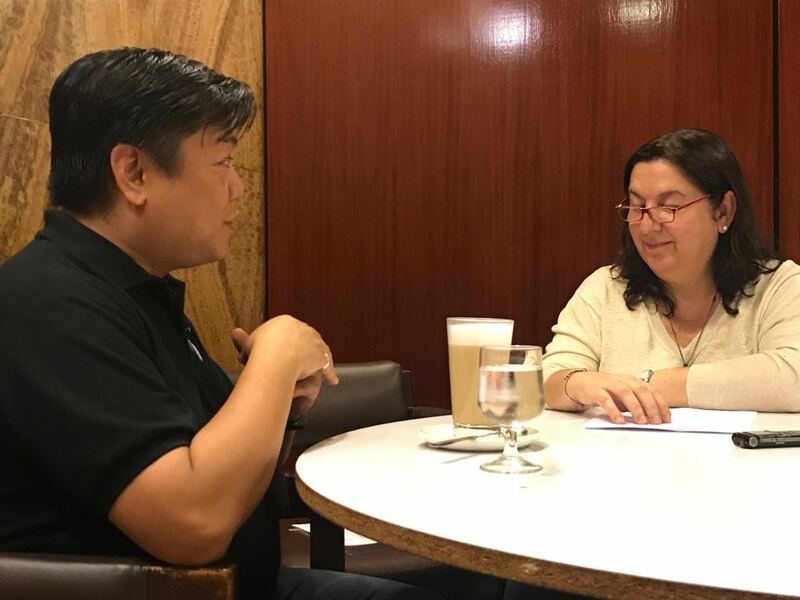 I started an interview with Mark Anthony Carpio, the choirmaster of the Philippines Madrigal Singers, one of the best choirs in the world. I finished a conversation with my friend Mark, a person that will always have a special place in my heart. – It has been for me an honor, I’m very grateful, Mark. – With your questions you are like giving me sparks in my brain, making me realize things. Thank you very much. Humble when we started, humble when we finished. Behind the lectern there are many hidden moments, some of them only for myself and others that I’d love to share. It could be like those funny outtakes that always make us laugh after a movie. It could be similar to that, perhaps, but not in all senses. The first scene that I have behind the lectern takes place when Mark and I agree for our appointment. I wrote him about the idea of the interview when they were on tour, I guess there were in Morocco by that time, but I did not get his reply then. 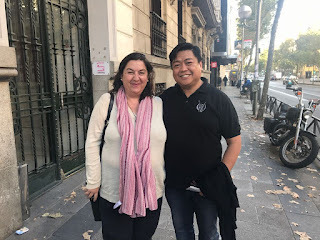 When they came to Madrid for the performance with Coro de Voces Graves de Madrid, I wanted to talk to him before the concert, as I supposed it would be more difficult later. The president of the Coro de Voces Graves de Madrid, Canetto, guided me through the halls and rooms of the lower level of the big church where the performance would start soon and then I could reach the room where the Philippine Madrigal Singers were getting ready before singing: some of them were warming their voices up, ladies with the make-up and someone was singing. Mark smiled and hugged me friendly, apologizing for not having replied me yet. We spent less time in the appointment details, date, hour and place, that the time I spent in finding them in the church. Our second scene after the lectern takes place during the interview. My daughter Alicia is a member of Cantate Mundi and she is also the one who took care of the recording and later will edit the video. During the recording she stopped us for a moment, while doubting if the camera was high enough, and then she said that the camera should be high to avoid showing double chin. Mark was listening without understanding our conversation, which I had to translate for him and then he suddenly laughed out loud, as well as we did, telling Alicia with his hand to put the camera even higher than it was. There is a recording of this moment, which was really funny. Our third scene took place several days after the interview finished. Tolosa and the European Grand Prix came first, after it Mark flied to USA and I went to Tolosa for the contest too. Later I wrote the interview in English and sent it to Mark, so that he changed whatever he wanted, while I was with the Spanish translation. I must say that he didn’t change things from the interview more than repeated words or expressions, sentences perhaps too much colloquial, but not more changes, something I loved. Beatufil, isn’t it? But wrong. Mark’s sentence did not contain the expression ‘this world of choirs’, but the one ‘this world of ours’. All the differences he talks about go further than choral world, the differences live in our world, in our life, in people. When I noticed the mistake, as a couple of letters can change the meaning of a very important idea, I wrote Mark to tell him I was really moved by his thoughts, because we all should think about them and also because they made me add this chapter to the interview, as I wanted to share it all.